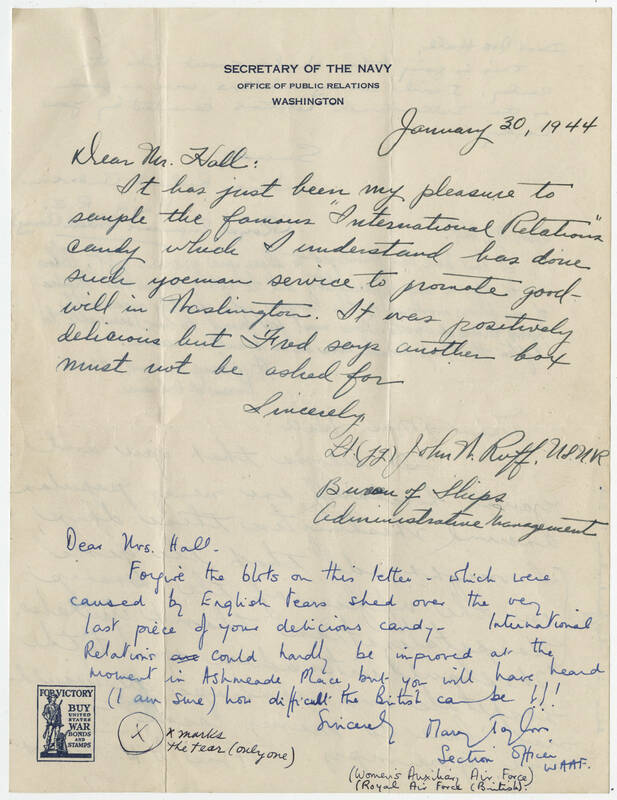 SECRETARY OF THE NAVY OFFICE OF PUBLIC RELATIONS WASHINGTON January 30, 1944 Dear Mrs. Hall: It has just been my pleasure to sample the famous "International Relations" candy which I understand has done such yoeman service to promote goodwill in Washington. It was positively delicious but Fred says another box must not be asked for Sincerely, Lt. (jg) John W. Ruff, U.S.N.R. Bureau of Ships Administrative Management Dear Mrs. Hall. Forgive the blots on this letter which were caused by English tears shed over the very last piece of your delicious candy. International Relations could hardly be improved at the moment in Ashmeade Place but you will have heard (I am sure) how difficult the British can be!!! Sincerely (Mary Taylor?) Section Officer WAAF X x marks the tear (only one) (Women's Auxiliary Air Force) (Royal Air force (British).